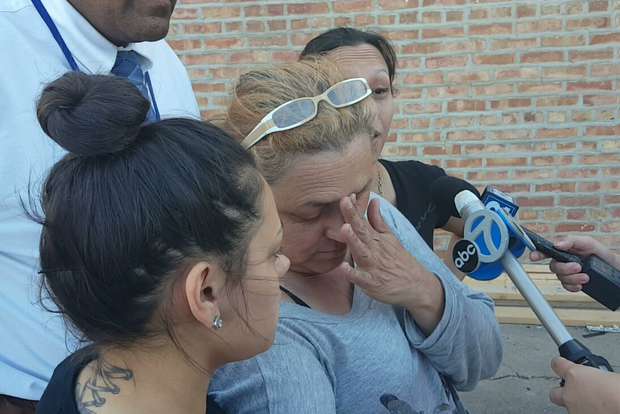 Diane Mercado, center, talks about her 15-year-old daughter Veronica Lopez, who was shot to death on Lake Shore Drive early Saturday morning. THE LOOP — Chicago's violent spring spilled through Memorial Day weekend, with six more people getting shot dead and another 63 wounded in the city's neighborhoods. From Friday night through late Monday, police officers, paramedics and doctors tended to the victims, which included a teenaged girl murdered in a moving car on Lake Shore Drive near Fullerton. This year's Memorial Day weekend was bloodier than in 2015, when 54 people were shot during the same period. But that weekend saw 12 people killed. "It's unacceptable," Mayor Rahm Emanuel said at a Tuesday morning news conference at City Hall. "Memorial Day is a time when we begin our summer. Families should be able to enjoy the time in their backyard, their barbecues, the beaches, and a lot of families did. But a lot of individual families did not." 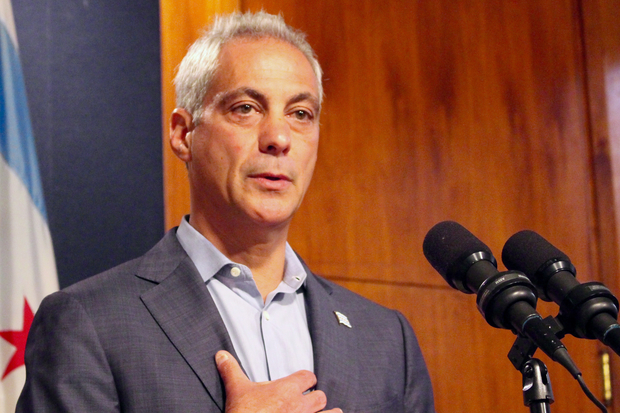 Mayor Rahm Emanuel called the Memorial Day weekend gun violence "unacceptable." So far this year, 1,234 shootings have been recorded in Chicago, compared to about 800 by this time in 2015. This month has seen 307 shootings, compared to 255 last May. • Two men were found shot to death around 11 p.m. Monday night: one in West Ridge and the other in Washington Park. • At 10:35 a.m. Monday morning, a 17-year-old was hurt in a drive-by shooting in Austin. • Around 4 p.m. Monday afternoon, a 15-year-old boy was shot in Englewood. • About a half-hour later, a 17-year-old was shot in Little Village. • Most recently, around 1:45 a.m. Tuesday morning, a 30-year-old man was walking in the 10200 block of South LaSalle Street in Roseland when a man walked up and shot at him, according to Officer Bari Lemmon, a Chicago Police spokeswoman. The man was brought to Advocate Christ Medical Center with a gunshot wound in his shoulder, Lemmon said. Police could not provide his condition, but said he was "stable." • Around 12:50 a.m., a 17-year-old was walking on the sidewalk in the 2600 block of East 73rd Street in South Shore when she heard gunshots and felt pain, Lemmon said. The teen was taken to Northwestern Memorial Hospital, where she was "stable" with a gunshot wound in her back, police said. Police later identified a 21-year-old man who was also hurt in the shooting. He was brought to Northwestern Memorial Hospital, where he was in good condition with a gunshot wound in his back, Lemmon said. • About a half-hour earlier, four people were caught in the crossfire of two men shooting at each other in the 3300 block of West Huron Street in East Garfield Park, police said. A 52-year-old was shot in his foot and brought to Norwegian Hospital, where he was listed in good condition, Lemmon said. An 18-year-old woman, a 19-year-old woman and a 30-year-old man were all shot in their legs and brought to Northwestern Memorial Hospital, where they were in good condition, Lemmon said. • Around 9:30 p.m. Monday night, a 24-year-old man was walking in the 1500 block of East 73rd Street in Grand Crossing when someone shot at him out of a passing light-colored car, police said. The man was brought to Stroger Hospital, where he was "stable" with a gunshot wound in his right arm and left leg, police said. • About 4:55 p.m., a 16-year-old boy was standing on the sidewalk in the 8700 block of South Escanaba Avenue in South Chicago when a man emerged from a nearby gangway and shot at him, police said. The boy was taken to Advocate Christ medical Center, where he was "stable" with a gunshot wound in his right leg, police said. Police said the boy is a documented gang member. • Just before 11 a.m. Monday, two men were standing in the 3800 block of West Gladys Avenue when someone shot at them out of a passing black Nissan, Lemmon said. One man, 28, was taken to Stroger Hospital, where he was listed in serious condition with a gunshot wound in his lower back, Lemmon said. The other man, 21, was shot in his elbow and brought to Mount Sinai Hospital, where he was listed in good condition, Lemmon said. Police said both men are documented gang members and convicted felons. No one is in custody for any of the shootings, police said. "Our children are having their childhood taken from them," Emanuel said in blaming the shootings on "gang-on-gang violence and people with records of violence who are still on the streets." He called for "tougher gun laws." Another four people were killed and 49 were wounded in shootings between early Friday and early Monday, police said. Emanuel praised the third annual "Summer of Faith and Action" program for minimizing violence in some neighborhoods. "I want to thank every member of the communities who came together in 'Faith and Action' to work with the Police Department to reclaim their streets," he said. He lauded "people of faith and community groups across the city partnering with the Police Department."